Today we all live in a world of click, post, and share. Social media has now become a part of our lives. Time flies like anything when we are checking the winning posts of our favorite football player or what our favorite singer is recording these days. Social media has not only brought all of us together, but it plays a major role in keeping us informed about where the world is heading to. The latest trends or the coolest apps, everything is just a swipe away, thanks to social media. Embracing the fact that it is no bad thing, every individual should still be careful about it, especially the students. Check out these 5 tips to stay smart on social media. Your social media account can tell a lot about yourself. So, make sure that you resonate with whatever you post. Your profile creates a similar kind of image of you among your followers. Thus, if you can find a way to let your personality come through your social media you can build a nice online presence. Social media has made it possible to access and promote many services, whether it is finding a coach or getting help in writing MBA assignments. Similarly, you can also center your social media on your hobbies, passions or something with which others may also relate themselves. Be creative and post thought-provoking content. If your account is sending out high-positive vibes, people will surely love to connect with you. It is good to share your opinions and perspectives with others but there is a way to say everything. Directly targeting someone and posting inappropriate things may put out a bad image of yours on social media. We should understand that being on social media or having thousands of followers doesn't give us the right to say negative things about any specific person or group of people. Try and maintain a level of positivity on your social media account. Moreover, do not post, comment or share anything when you are feeling way too emotional. Take your time and allow your mind to relax and get back into action. A response based on an emotion is generally a reaction and reacting to issues that do not matter in your personal or professional life will bring no good to you. This is something important. Set up your privacy settings properly with all your social media applications or sites that you are using. The social media platforms often change their privacy settings. Therefore, keep a check on any such emails or app notifications and do see what changes they have made. Another thing that most of us do not do when we join a social media platform is checking their terms and conditions. But, it is the only way to get to know about how they take care of our personal information or what they can do of our posts or any specific information that we may share with the service such as our location and phone number. Thirdly, remember that your privacy is completely in your hands. If you don't feel like following certain people or replying to certain messages, it is completely okay. It is not always needed to post about everything you do or every place you visit. Sometimes it's completely alright to turn off that location sharing option and keep things private. Post wisely and be mindful. Most of the times people do not care that much about what all random things are going on in your life. Posting too much may also appear like you do not have any important goals to accomplish in your day or you are not focused on life. Understand that just because you do not post many pictures every day doesn't mean that your life is not beautiful. Refraining yourself sometimes from being social and just cherishing the moments by yourself is also a pleasant experience to try. It is not your life’s mission to get ‘this’ amount of followers or ‘that many’ likes on your posts. Learn to embrace true connections than the virtual ones. For example, try to analyze how you feel when your friends comment on your posts and when a complete stranger comments on your posts. Friendships make you feel more secure and authentic in life as well as social media. Therefore, make sure you have a friend to talk to and not only to take pictures with. Your Instagram followers or Facebook friends would never truly know who you are than your friends and family members. Think outside social media sometimes and look around yourself. Give your phone a break. Take a digital detox. Draw, paint, listen to some good music, go for a drive, be in nature or spend some time with friends and family. Do something that makes you happy. It is completely over you if you want to leverage social media for your benefits or give it the power to affect your life in a negative way. If used effectively social media can help you find the best internships and job offers in your career. Follow more people who are related to your industry. Nowadays, whether it is educational institutions, teachers, or recruiters, everyone is present over social media. You can use it as an opportunity to create better connections. 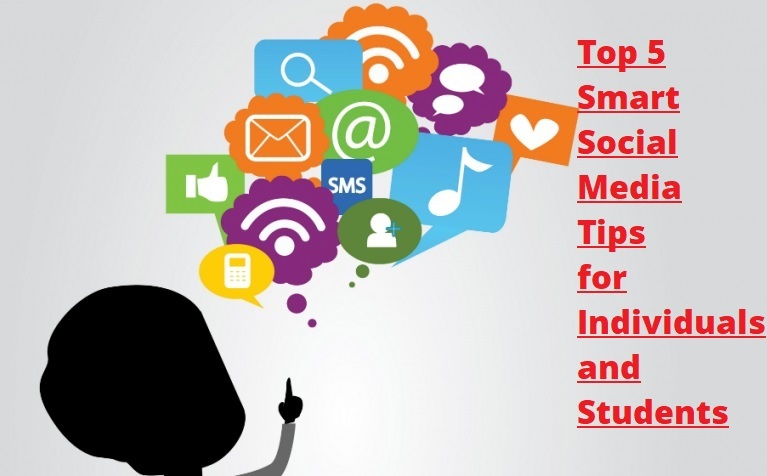 We hope that these tips will help you become a smart social media user.